WERE HOLDING OUR GRAND OPENING IN TESCO CAR PARK PEMBURY ON WEDNESDAY 3RD DECEMBER 2014.WELL BE OPEN EVERY WEDNESDAY & THURSDAY THEREAFTER. 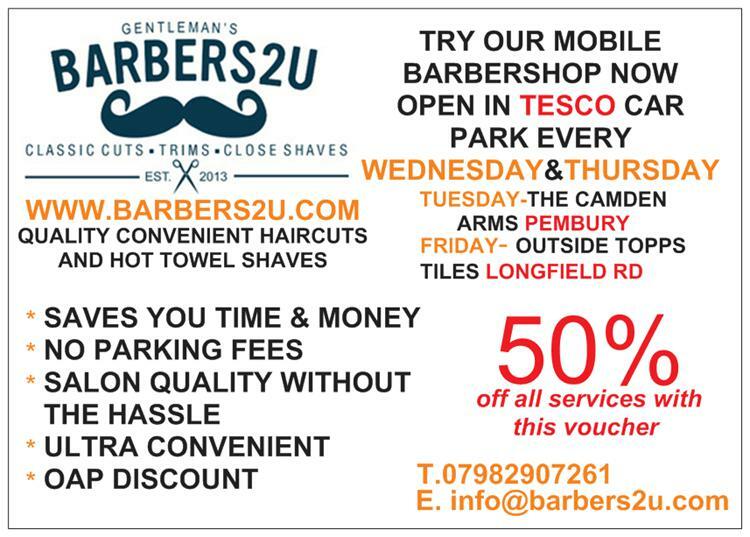 ALL SERVICES ARE HALF PRICE MEANING A HAIRCUT WILL COST ONLY £5.50 AND A HOT TOWEL SHAVE £6. WITH THE RISING COST OF TOWN CENTRE PARKING AND HEAVY TRAFFIC, OUR MOBILE BARBERSHOP IS IDEAL FOR BOYS AND MEN WHO LIKE TOP QUALITY SERVICE WITHOUT THE HEADACHE OF VISITING A TOWN CENTRE SALON. THE MOBILE SALON HAS BEEN OPEN FOR 3 MONTHS NOW AND IS GROWING QUICKLY.OUR CLIENTS RETURN REGULARLY AS ITS CONVENIENT TO VISIT US AND WE GUARENTEE TO BE PARKED IN FREE PARKING ZONES. OUR HOT TOWEL SHAVES ARE PROVING POPULAR TOO AS ITS AN IDEAL WAY TO RELAX AFTER A HARD WEEK AND LOOK GREAT AT THE SAME TIME. 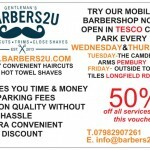 SO WHY NOT GIVE US A TRY AND SEE WHY BARBERS2U IS THE UKS FASTEST GROWING MOBILE BARBERSHOP.